Mark's edtechblog: Happy Earth Day! 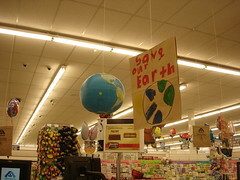 Hanging above the checkstand area of this Albertsons were dozens of Earth Day Grocery Bags and globes. How cool. Made me wonder how many thousands (hopefully) of other stores will be passing them out, with their beautiful kid messages and artwork. 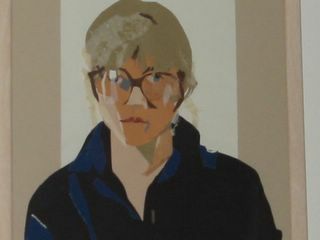 It is that wondering, coupled with hope, that keeps all of us leaning forward, I think. Happy Earth Day! I'm having awful times downloading my pictures, somehow related to my old, old digital camera and this new Mac I'm trying and who knows. But I am glad to say we participated, I have to go on and say it in the right way..I know. All that hard work is a testament to doing something. Beautiful images on your site.